I “discovered” anime on Compuserve’s Comics and Animation forum in 1990, but I didn’t get my first hands-on-fix until I found that the local comics shop actually had a few tapes available for rent. 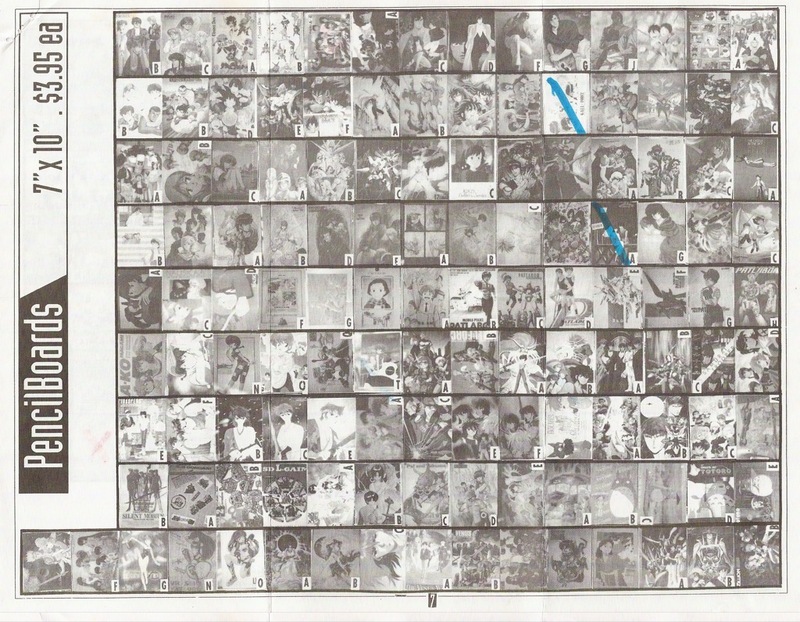 Most of these were untranslated multigenerational bootlegs, of course, though they did have the first couple of “Bubblegum Crisis” and “Dangaioh” and “Dominion” tapes, and those were subtitled. The first two tapes I rented were the Dirty Pair movie and the first Bubblegum Crisis OVA, by the way. I didn’t have a VCR of my own at home, so I watched them at work in the breakroom. Yeah, I had no idea what a “career limiting move” was and I’m probably lucky that the only person who came in and boggled at the screen was a friend of mine. Anyway, I watched what the comics store had to offer, and then a couple of other video stores in town started carrying anime tapes, and things were getting off to a pretty good start as far as I was concerned. I also wasn’t spending TOO much money, because, well, the options I had to spend it on were pretty limited. The comics shop had some translated manga to buy, but that was about it. I did find out that one of the local records store could order CDs from Japan if I had a catalog number, so I asked them to order me the first Bubblegum Crisis Vocal Collection CD. Several months after I placed the order, it actually arrived and I practically danced my way over to give them my thirty bucks for it. Oh, and I bought my first VCR. It was a Samsung 4-head job that didn’t do stereo and that wouldn’t play certain brands of tape and that cost me $240 (basically a week’s pay) … but it was MINE. Then I saw a reference online to someplace called “Nikaku Animart“, which seems to still be open today, that sold stuff relevant to my interests and that would cheerfully send me a catalog from which I could make selections. 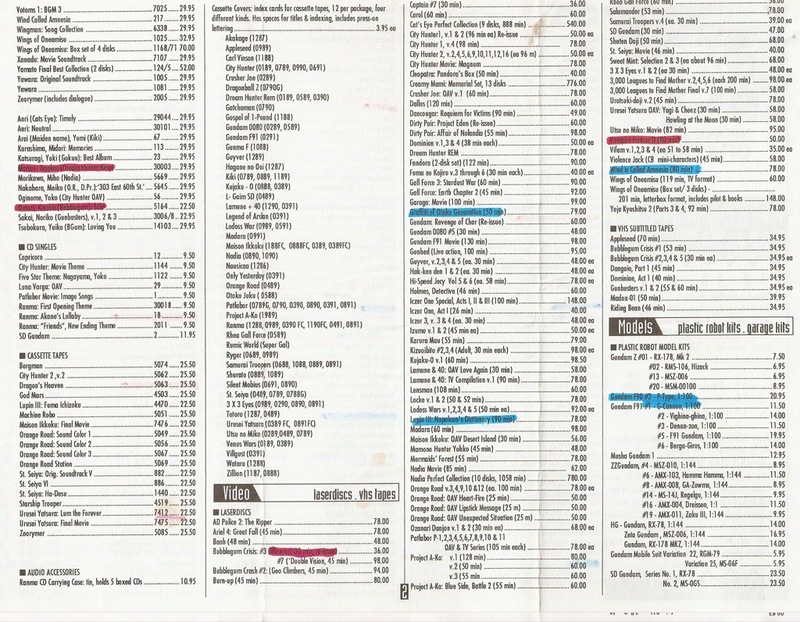 That catalog is reproduced below, mostly for my nostalgia. 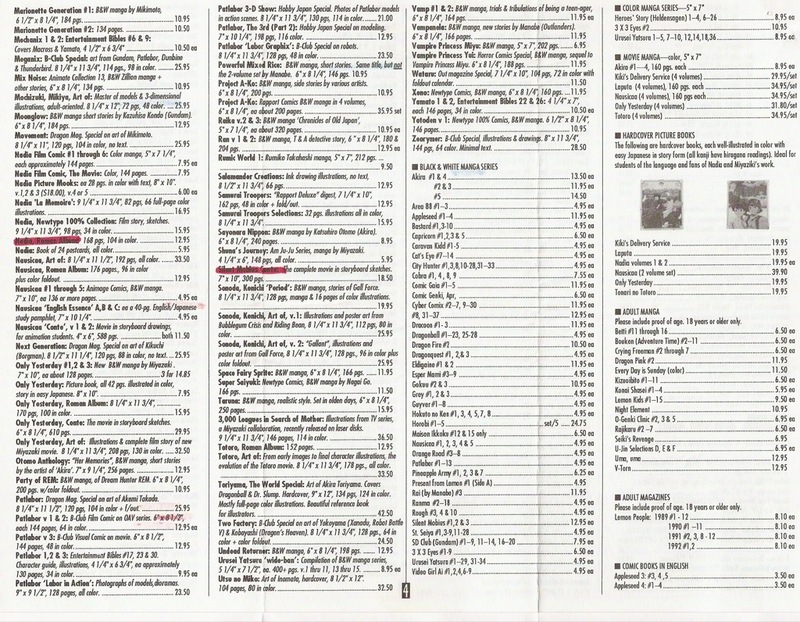 Page 1: CDs. Note that the CD I REALLY wanted to get, the Gunbuster soundtrack, is marked off in blue ’cause they were low on stock. By the time I called, they were out of stock. 18 years later, I still don’t own this CD. Page 2: Video. This is mostly imported laserdiscs. If you thought spending $20 on a four-episode DVD was expensive, imagine dropping 70 or 80 bucks on a single half-hour of animation. These prices were obviously bargains compared to importing the laserdiscs, and you even got a translation. Page 3, 4, and 5: Models, books, magazines, manga. English-translated manga is on page 5. 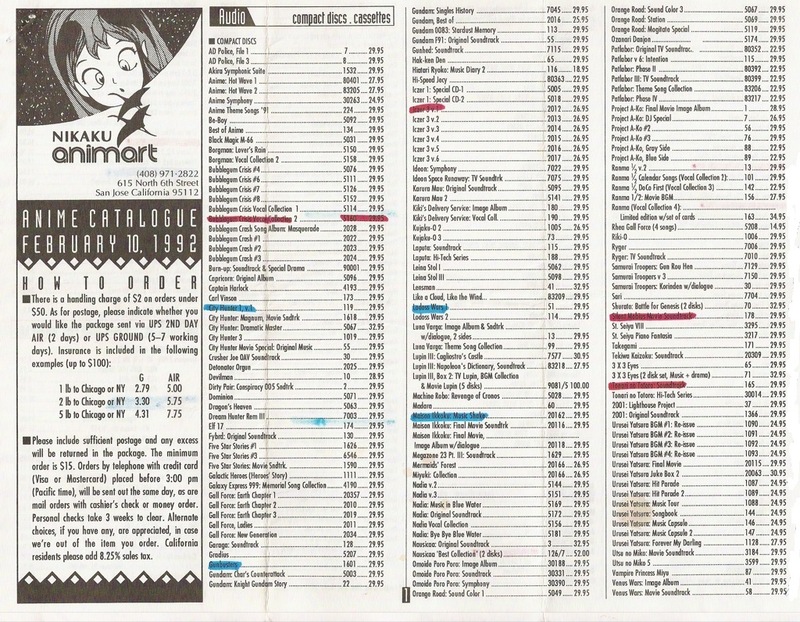 These were prices for single “issues”, which were usually two chapters from a given manga and about 32 pages long. VERY expensive compared to the Japanese originals, but you could actually read them. Page 6: Miscellany, posters, pencilboards, etc. 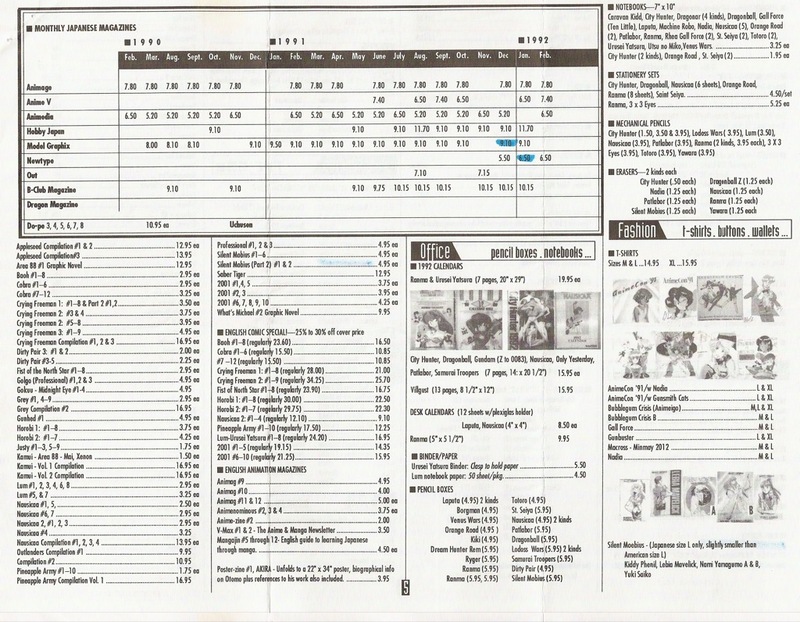 Looking at this now, I really wish I’d gotten some of the 10 Little Gall Force trinkets on offer, or those Ranma door curtains. 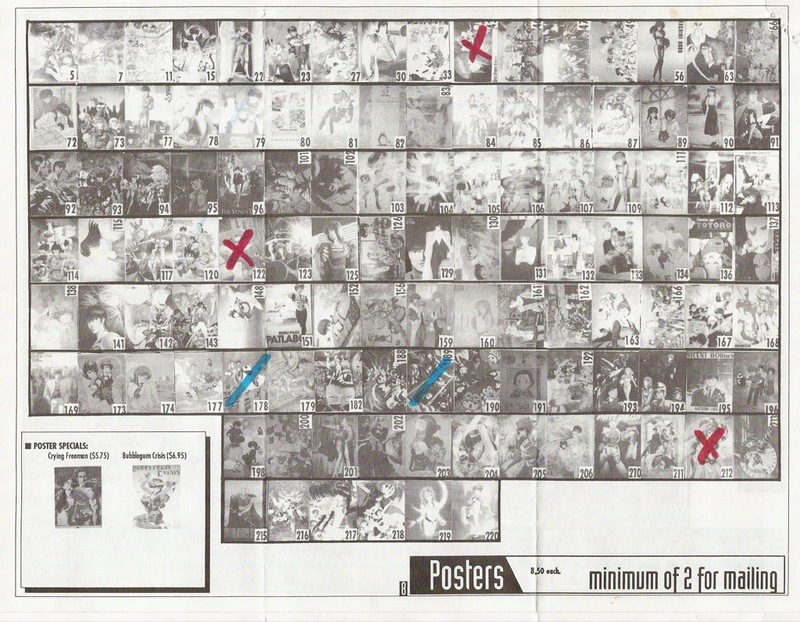 Pages 7 and 8: Obviously, you couldn’t be expected to buy a poster or pencilboard solely because it was from a particular show, so they thoughtfully provided these visual guides, if you can call them that. 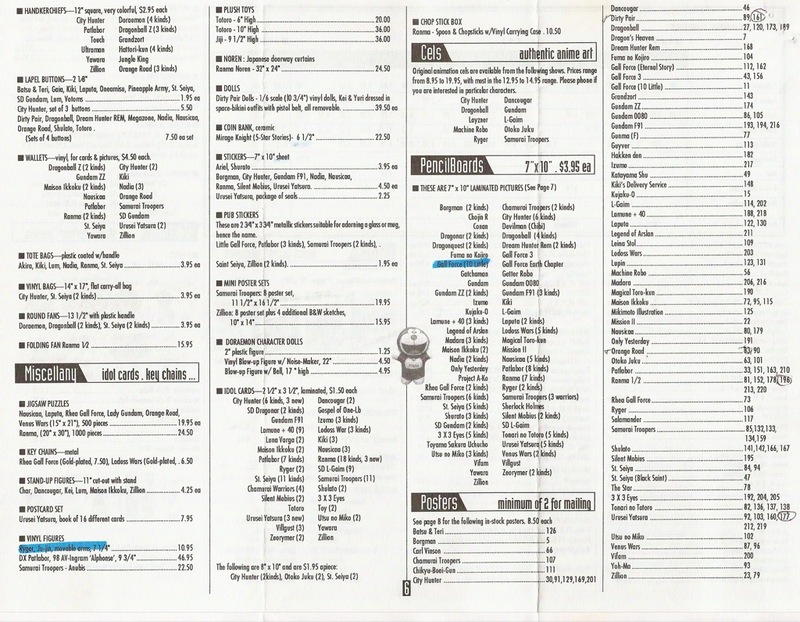 Try to imagine making buying decisions from these sub-postage-stamp sized black-and-white examples, if you will. 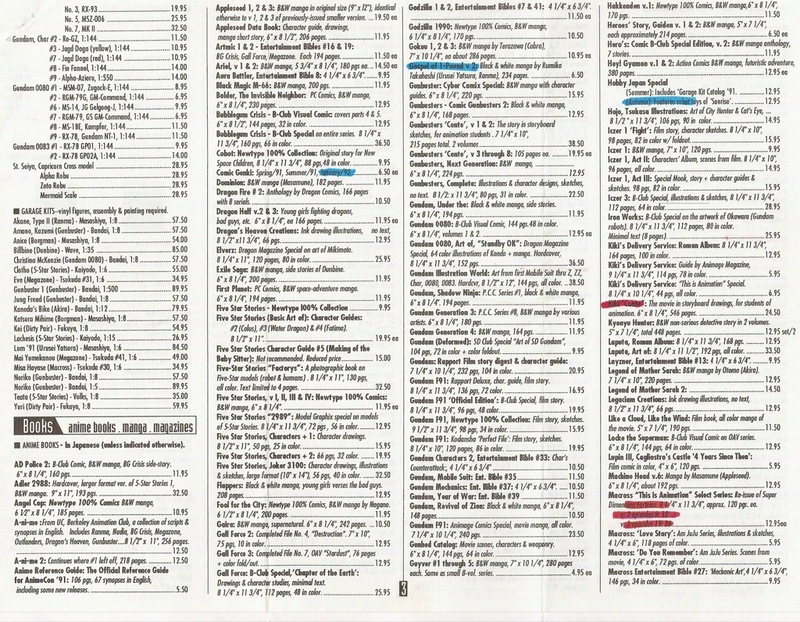 Anyway, once this catalog hit my hands, it was pretty much over for me financially. After Nikaku, I discovered Kimono My House and the Right Stuf, and, well, things happened. No, I didn’t ACTUALLY declare bankruptcy at any point, that was just there for hyperbole.